Place the biscuits in a food processor and process until they resemble fine breadcrumbs. Add the butter and process until combined. Spoon into a lightly greased 1.5 litre-capacity pie dish and smooth the mixture over the base and sides of the dish using the back of a spoon. Refrigerate for 30 minutes. Place the milk, cream and both chocolates in a medium saucepan over medium heat and cook, stirring frequently, until the chocolate has melted and the mixture just comes to the boil. Place the brown sugar, caster sugar, cornflour, whiskey and egg yolks in a large bowl and whisk to combine. Whisk in the chocolate mixture. Transfer the mixture back to the saucepan and cook, whisking over medium heat, until the mixture comes to the boil. Continue whisking for 1–2 minutes or until thickened. Set aside to cool for 10 minutes. Whisk the mixture again, pour into the pie shell and refrigerate for 3 hours or until firm (see note). To make the toffee meringue, place the water, 1½ cups (330g) of the caster sugar and cream of tartar in a medium saucepan over high heat and stir with a metal spoon until combined. Increase the heat to high, bring to the boil and cook, without stirring, for 7–8 minutes or until lightly caramelised. Remove from the heat and allow to stand for 4 minutes (the caramel will continue to get darker). Place the reserved eggwhites in an electric mixer and whisk until soft peaks form. Gradually add the remaining sugar, whisking until the mixture is well combined and glossy. Add the toffee in a thin, steady stream and whisk until combined. Whisk for a further 2–3 minutes and gradually whisk in the extra water. 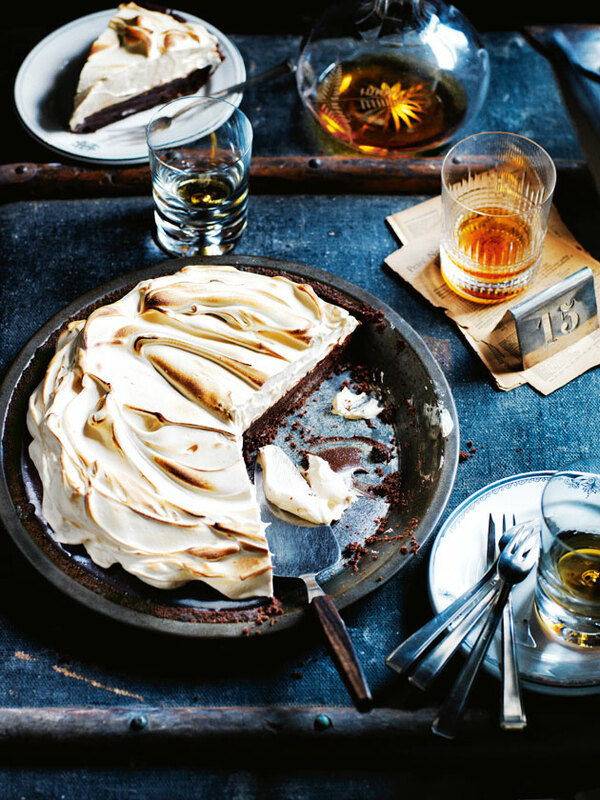 Top the pie with the meringue and use a small kitchen blowtorch to caramelise the meringue. Refrigerate for 30 minutes before serving. Serves 8–10. note: The mixture may look like it has split at this stage; simply whisk it again to combine. tip: You can make the pie 1 day in advance and refrigerate. Make the meringue on the day of serving. Super rich dessert but oh so delicious, perfect dessert for a large group as you only need a small portion. Also tastes even better the next day!